Tulsi plant is the most sacred plant in Hinduism and it is associated with Krishna. Below is the mantra and rules on plucking leaves. Tulsi plant should be touched only after taking bath. Tulsi leaves should be plucked after offering prayers to Krishna and Mata Tulsi. 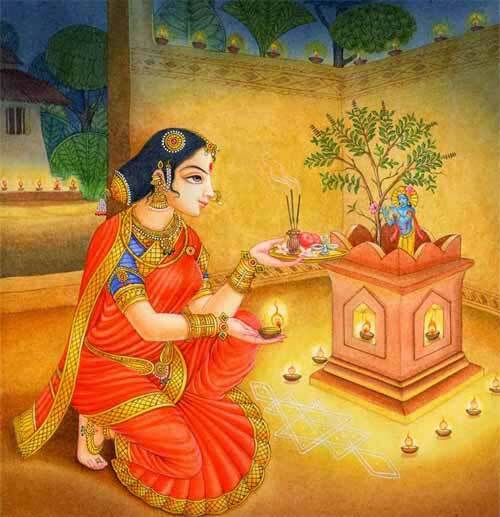 Permission should be taken from Goddess Tulsi before plucking leaves. Do not pluck Tulsi leaves with an impure mind. Talking and picking or plucking tulsi leaves is considered inauspicious. Keep the mind focussed on the plant or Bhagavan while plucking the leaves. Picking Tulsi while having negative thoughts, anger, hatred, ill feeling will cause harm the person plucking the leaves. The leaves that have fallen on the ground is considered very good for pujas and for medicinal purposes. The plant should not be damaged. It should not cut and trimmed. Tulsi should not be plucked on Amavasya (no moon day), Saptami (seventh day of fortnight as per Hindu calendar) and Chaturdashi (14th day of a fortnight). It should also not be plucked on Sunday and Friday. Light lamp using pure cow ghee near Tulsi in the morning and evening is considered highly auspicious. It helps in retaining peace, prosperity and good health. Make sure the lamp and its heat do not damage the plant.